Adjustable Kirsch standard curtain rod 48" to 86"
Lockseam, metal single curtain rod, 3" clearance. White finish, includes mounting hardware. 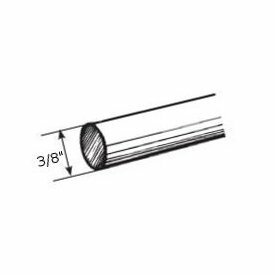 6136-025: Adjustable Kirsch standard curtain rod 66" to 120"
Proj 3" - 4 3/4", Return: 3 1/2" - 5 1/4", Height: 3", Width: 3/4". Wall mount bracket for 1 inch diameter Valencia curtain rod with adjustable projection from wall. Includes lock screw to hold rod and finial in place. Available in Valencia colors in stock anc custom finishes. Customize this finial to your taste from pebbles to petals, or how about colorful jelly beans. Steel cap ends with hollow clear tube between to display your design. Let your imagination run wild! 2 1/2" wide. Valance curtain rod, white finish, clearance 6-8.5 inches. 2 end brackets and 2 supports included. 6747-025: Continental II valance rod 86"-150"
Bay windows and corner window angle sections for the Kirsch 94003 Architrac system. Use splice 94110-090 to connect sides to straight sections and be sure support brackets are close to each side of splice. Extruded aluminum finished in white. 9046-Angles: Custom angle bends for 9046 track 24" x 24"
94005-Angles: Custom angle bends for 94005 track 24" x 24"
Metro Track system ceiling mount bracket with a 1 1/2" projection. Use one bracket for every three to four feet for best results. Note: This bracket drops down 1 1/2" from the ceiling to the center of the rod. Ball bearing carriers make traversing your drapes smoother, especially with heavier fabrics. Micro width allows for smaller stack on sides when opened.